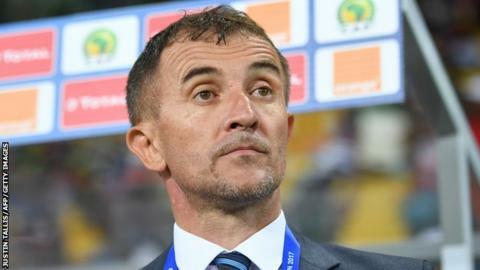 Milutin 'Micho' Sredojevic has terminated his contract as coach of Uganda's national team over the issue of unpaid wages. His future as coach of The Cranes had been the source of much speculation all week which led to him meeting Uganda FA (Fufa) officials on Monday. On Saturday, Micho confirmed to BBC Sport that he was leaving his position. "It is a notice of termination due to non payment of salaries," the Serbian stated. The 47 year old had been in his position as Uganda coach since his appointment in May 2013. During his tenure, he famously guided The Cranes to their first Africa Cup of Nations finals in 39 years when they qualified for Gabon 2017. Uganda's FA issued a statement on Saturday saying they "will forever keep those memories with them." They thanked the coach for his services and wished him well for the future. The past year has been dogged by issues surrounding Micho's salary arrears and he had recently admitted on his social media that other offers had starting coming his way. Now he says the issue over his wages has taken too long to resolve and he could not stay in the Uganda post any longer. "It has gone too far now, the point of no return has been reached," Micho told BBC Sport when asked if there was any chance he might change his mind. Micho has a long history in African football having also coached in Ethiopia, Sudan, South Africa, Tanzania and Rwanda. He proved a popular figure as Uganda coach and said he is upset at leaving the post. He does not, however, want to dwell on his exit for too long and hinted he may be ready to move forward. "It is like someone died to me or a break up with a woman. "If you stay you think so much, but if you work you forget about it all and move on," Micho told BBC Sport. Uganda's FA will be keen to get a coach in place for their next set of 2018 World Cup qualifiers. The Cranes, who are currently second in Group E, take on Egypt at home on 31 August and then away on 5 September.